Over 25 years ago, the company that invented the concept of the SUV re-invented the idea for a whole new generation of Americans with the 1993 Jeep Grand Cherokee. Bridging the gap between a tough, capable 4×4 and a comfortable, reliable family car, the Jeep Grand Cherokee has since sold millions. With the 2019 Jeep Grand Cherokee, Jeep has managed to build their best Grand Cherokee ever, packed with modern design, incredible performance and cutting edge technology. Looking to buy a 2019 Jeep Grand Cherokee in Fayetteville, Arkansas? Then stop in today at McLarty Daniel Chrysler Dodge Jeep Ram Fiat in Springdale! 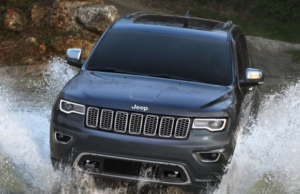 We have the 2019 Jeep Grand Cherokee in all trim levels, from the unstoppable 2019 Jeep Grand Cherokee Trailhawk, to the unbeatable 707-horsepower 2019 Jeep Grand Cherokee Trackhawk! Come see us for a test drive today! TOUGH, PURPOSEFUL DESIGN: One look at the 2019 Jeep Grand Cherokee is enough to know that this isn’t your average, never-leave-pavement SUV. Like all Jeep vehicles, the 2019 Jeep Grand Cherokee wears its long heritage on its sleeve with details like the iconic seven-slot grille that has graced Jeeps since the 1950s, and the trapezoidal wheel arches that call back to the first Jeeps that helped win World War II. Short front and rear overhangs and high ground clearance speak to the 2019 Jeep Grand Cherokee’s off-road capability, allowing it to climb up and over obstacles that would stop most SUVs in their tracks, while the tasteful use of chrome, sleek and aggressive lines and steeply-canted rear glass lend an attitude of speed even when sitting at the curb. WORLD-CLASS PERFORMANCE: With a range of four engines, there is truly a 2019 Jeep Grand Cherokee for everyone. Base power is the reliable 3.6-liter Pentastar V6, with 295 horsepower and 260 lb.-ft. of torque, for maximum towing of 6,200 pounds when properly equipped. Need more get up and go? There’s the available 5.7-liter Hemi V8, with a robust 360 horsepower and 390 lb.-ft. of torque on tap, Performance enthusiasts can step up even further to the 6.4-liter Hemi V8 in the 2019 Jeep Grand Cherokee SRT, with 475 horsepower and five drive modes, including Auto, Sport, Track, Snow and Towing. And for the ultimate in performance, there’s the dragstrip ready 2019 Jeep Grand Cherokee Trackhawk, with a supercharged 6.2-liter Hemi V8 putting out 707 horsepower, capable of launching the Trackhawk from zero to 60 in 3.5 seconds and blasting the quarter mile in 11.6 seconds. UNSTOPPABLE OFF-ROAD CAPABILITY: For over 75 years, Jeep has been synonymous with incredible off-road capability. With the 2019 Jeep Grand Cherokee, old-fashioned engineering melds seamlessly with cutting-edge technology to build one of the toughest and most capable Jeeps ever. Whether you need high ground clearance or low profile aerodynamics, the 2019 Jeep Grand Cherokee’s new, class-exclusive Quadra-Lift suspension can handle it, giving you the ability to literally raise your Jeep two inches at the touch of a switch for more ground clearance. A creek or stream in your way? Ford water up to 19 inches deep with confidence, thanks to advanced door and electrical sealing techniques. Rocks in your way? Crawl through with less anxiety, thanks to details like hardened steel skidplates protecting all major drivetrain components, frame-mounted towhooks, and the 2019 Jeep Grand Cherokee’s incredible lineup of advanced 4×4 drivetrains. Comfortable, capable, beautiful and reliable, the 2019 Jeep Grand Cherokee is the SUV that never lost the reason the brand was originally built in the first place: to get you out there to find adventure, whether on the dragstrip, on the trail, or on the streets of the biggest city. Are you looking to buy a 2019 Jeep Grand Cherokee in Fayetteville, Arkansas? 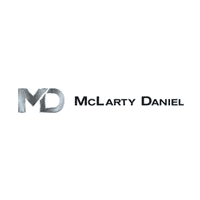 Then come see us at McLarty Daniel CDJRF of Springdale! We have the 2019 Jeep Grand Cherokee in every trim package, from off-road rig to drag strip terror! Come see us today for a test drive, or check out our big selection online right now!